OJ Simpson is asking a Nevada judge to grant him a new trial in the 2008 armed robbery case that left him serving a 33-year prison sentence. In his long-shot appeal, football legend OJ Simpson argues his defense lawyer was ineffective. OJ Simpson was convicted of the robbery of what he said were stolen articles of personal memorabilia. Separately, OJ Simpson was acquitted of the murder of his former wife and her friend in Los Angeles in 1995. The former NFL running back is expected to testify during the five-day hearing, which begins on Monday. The former defense lawyer, Yale Galanter, declined to comment ahead of his scheduled testimony. In 2007, OJ Simpson and five other men confronted sport memorabilia dealers in a Las Vegas hotel room. During the incident, two of OJ Simpson’s alleged co-conspirators carried guns. OJ Simpson says Yale Galanter was ineffective at the subsequent trial because he had an personal interest in keeping private his own advice to Simpson. Yale Galanter, according to OJ Simpson, had repeatedly assured him that he could take back items related to his sporting career – items Simpson believed had been stolen – as long as no one trespassed and no force was used. The defense lawyer continued to conceal he was a witness to the crime, including during an appeal to a state court in 2010, Simpson says. In a sworn statement outlining his planned testimony, OJ Simpson says Yale Galanter “vigorously discouraged” him from testifying and never told him that prosecutors were willing to let him plead guilty to charges that would have brought a two-year minimum prison term. 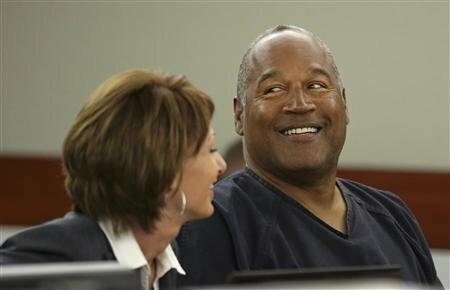 “He consistently told me the state could not prove its case because I acted within my rights in retaking my own property,” OJ Simpson said. Dr. Norman Roitman, a Las Vegas psychiatrist, is expected to testify on Monday that OJ Simpson’s perception of what took place at the hotel room might have been muddled by football brain injuries as well as the effects of several vodka and cranberry juice cocktails. Also expected to testify is former co-counsel Gabriel Grasso and another psychiatrist called by lawyers representing the government. Appeals for a new trial because of ineffective counsel are seldom granted, but OJ Simpson’s history as a murder defendant in a widely-televised 1995 trial could affect the outcome, analysts say. Beyonce pregnant with baby No 2? Woman kicked off American Airlines flight for singing "I Will Always Love You"